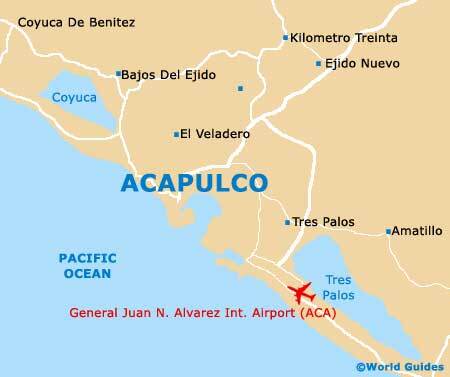 Acapulco's bustling hotel district is full of beach resorts and starts on the Playa Hornitos, close to the Parque Papagayo and heading in an easterly direction. Buses regularly travel along La Costera and connect this beautiful arc of sandy beaches, making them easy to reach from all over Acapulco. Two particularly notable beaches are the Playa Caleta and the neighbouring Playa Caletilla, both of which can be found within a cove setting, on the southern side of the nearby Peninsula de las Playas. These beaches are always popular with families visiting Acapulco and extremely suitable for children of all ages, with calm water suitable for paddling and swimming. Buses running to these beaches are always clearly marked 'Caleta' on the front. 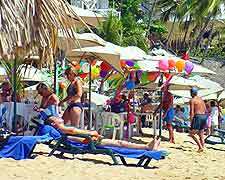 Located on the western side of Acapulco's Peninsula de las Playas and just a short walk from the Zócalo is the Playa La Angosta. This small and seclude cove offers a pleasant sandy beach and is usually fairly uncrowded. The Playa La Angosta is also close to the Hotel Avenida, off La Costera. 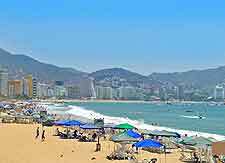 Many people visit this particular beach for the views of the famous Acapulco cliff divers, plunging into the sea beneath. Close to Acapulco, further beaches include the Playa Pie de la Cuesta, the Playa Manzanillo, the Puerto Marqués, the Playa Tamarindos, the Playa Tlacopanocha and also the Playa Revolcadero, which is a great spot for surfing, with strong waves suiting surfers of all abilities. Acapulco tourists often take a short boat trip to the nearby Isla de la Roqueta and the main beach here is usually very popular and filled with holiday makers.